We planted Swiss chard for the first time this year, our experiment of the year. Chard’s vibrant colors are a tip-off that it is packed with nutrients. Indeed, chard ranks third on the CDC’s list of powerhouse vegetables. I am a huge fan of spinach, so it should follow that I’d enjoy chard too. But it’s just a little too tough for my taste. We tried several recipes (thanks Michelle!) and I gamely chewed, and chewed. Then CRR came up with a great idea. Use the chard as a substitute for spinach to make spanakopita. Brilliant (as he will tell you). Credit where credit is due. 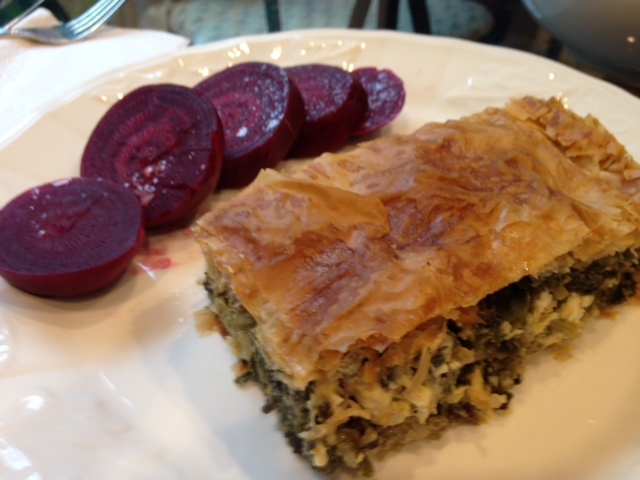 We dined on chard-akopita last night with the first of the garden beets. A feast for a king/queen! Heat saute pan over medium high heat. Add chard and toss with tongs until it is wilted, about 4 minutes. transfer to a colander to cool. Then wring as much liquid as you can from the wilted chard. Add oil to the pan and cook scallions until soft and fragrant. Add the chard to the pan. When it is cool, add cheese, eggs, herbs, nutmeg and salt. With a pastry brush, lightly coat bottom and sides of a 9×13 pan. Working quickly, lightly oil one sheet of phyllo and place into pan. Repeat with 8 more sheets, alternately each so the phyllo reaches halfway up the sides. Spread the filling evenly. Then top with 9 more phyllo sheets, oiled one at a time and alternated so they reach up the sides. Then gently push the edges down so the filling is enclosed. With a sharp knife, gently score the top phyllo layer, being careful not to cut through to the filling. Using the same pastry brush, brush the milk along all the score marks; this will keep the phyllo from flaking up. Bake at 375 for 35-45 minutes or until golden brown. Serve warm or at room temp.